Here's why you're seeing more specks overhead. 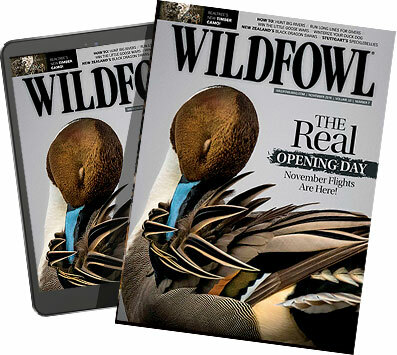 It wasn’t unusual for Jay Gunn to see a small flock of white-fronted geese when he was duck hunting in Arkansas 25 years ago. The birds were always around, but they were little more than a novelty. Gunn even scratched a few down when they glided low over his blind. Times have certainly changed. Gunn, who hunts almost exclusively in west-central Mississippi now, has become mildly obsessed with specks. A meticulous record-keeper, he and his friends hunted 28 days in 2015 and killed 212 birds. The limit was just two birds per day. A year later, the USFWS bumped the limit to three birds and Gunn and his partners shot 252 geese. Last year, their total kill was 359 over 35 days. Part of that spike in white-front numbers where he hunts is due to an overall increase in their population. USFWS goose specialist Josh Dooley says mid-continent white-fronted geese numbers increased over the past decades thanks to favorable nesting and winter habitat conditions and conservative regulations. Their numbers have stabilized for the most part in recent years, bouncing up and down between 600,000 to around 1 million, based on an annual survey conducted in Alberta and Saskatchewan. A more likely reason Gunn sees so many specks in Mississippi now is the result of an entirely different phenomenon. Some still do migrate to the Gulf Coast. According to USFWS harvest data, Texas hunters shot 50,000 specks in 2016. Louisiana waterfowlers killed more than 68,000. However, harvest trends in both states have been relatively flat for decades, despite the long-term increase in goose numbers. That hasn’t been the case in Arkansas, the largest rice producer in the country. In 1994, Arkansas hunters shot about 7,000 specklebellies. In 2016, they bagged 70,000. He thinks many of those birds that still go to Texas in the fall spend just a couple of weeks there before trickling back north to Arkansas. Others discovered new food sources north of the historic wintering grounds along the Gulf Coast. An increasing number also winter in Mississippi where Gunn hunts and more are showing up in west Tennessee and other places they were rarely seen a few decades ago. Mid-continent specklebellies aren’t just wintering farther east, they have shifted their migration routes that way as well, likely because of better food sources. Pacific Flyway specks haven’t changed their migration patterns dramatically. They are a separate population, nesting in different locations than mid-continent geese. However, their numbers have increased more substantially than mid-continent specks. Current estimates based on breeding ground surveys in southwest Alaska place the flyway population at around 600,000, up from around 100,000 in the 1980s. That increase may seem like a windfall to hunters. Daily limits are as high as 10 birds in most of the flyway and seasons run for 100 days or more and extend into March. However, the abundance of specks may be having a detrimental impact on wintering ducks wherever they share habitat. White-fronted geese are one of the earliest migrating waterfowl, showing up in Arkansas around Oct. 10, on average. Only teal and some pintail arrive sooner. He hopes to initiate a study that examines the impact of specklebelly and snow geese on ducks by examining their direct impact on available food. Researchers in California are asking the same questions. A study is underway to determine if white-fronted and snow geese are competing with ducks for limited food resources. The U.S. Geological Survey, California Waterfowl Association, USFWS and others will examine GPS data from collared geese and combine it with other research that has examined specklebelly diets. The results can help managers reduce potential competition and conflicts through harvest strategies and habitat conservation efforts. 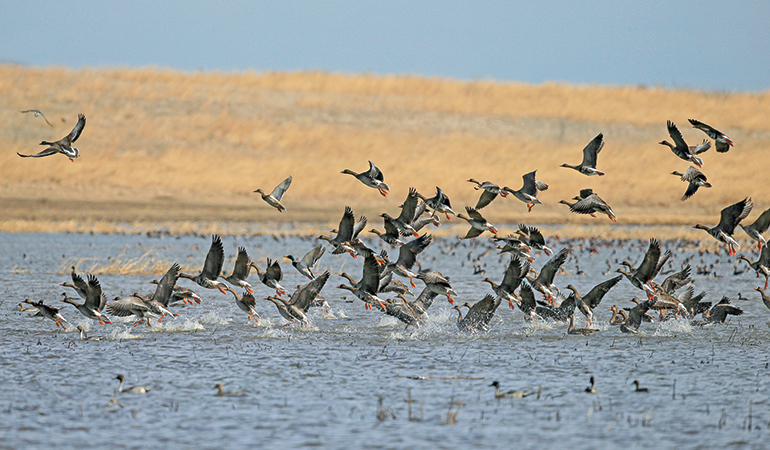 In the meantime, most waterfowl managers would like to see a higher harvest of specks in the Pacific Flyway. The population objective for the entire flyway is 300,000, less than half of the current population. Interest in hunting specks has increased throughout their range, but the Pacific Flyway harvest remains far below the necessary level to knock down their numbers. The total annual harvest hovers around 60,000 adult and juvenile birds. “Conditions on the breeding grounds were generally favorable over the past decades, harvest regulations were fairly restrictive for a long time and the geese are taking advantage of changing agricultural practices. There is more food available. Other Pacific Flyway goose species have seen population increases for many of the same reasons,” says Dooley. Managers have substantially liberalized white-front harvest regulations for most of the Pacific Flyway, but increasing the harvest even more through regulatory changes will likely prove challenging. However, Dooley hopes more hunters take advantage of the existing opportunities. But he does not expect harvest regulations in the Mississippi and Central flyways to change, at least not any time soon. Under the current management, the population would have to fall below 600,000 and harvest levels would have to go above 6 percent of the population for restrictive seasons to be adopted. Generally, mid-continent speck numbers have stabilized, so it is unlikely bag limits will be increased.